The map of Africanized honey bees (AHB) spread in the United States has been updated. It is now posted on the Agricultural Research Service's (ARS) website at www.ars.usda.gov/ahbmap/. 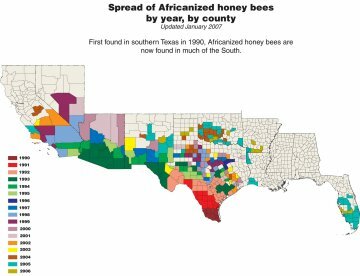 The map shows the spread of Africanized honey bees (AHB) by county by year. AHBs have continued their slow territorial expansion in the southern United States, and have now been confirmed in nine states. The map lists a county only when that state officially declares it to be Africanized. There are discontinuities in the spread, especially between Louisiana and Florida where AHB spread is likely a result of human-assisted transport�such as AHB swarms hitchhiking on trucks, railroad cars, ships or airplanes. Human-assisted transported AHBs are not considered a territorial spread unless the honey bees become established beyond the original swarm find. ARS updates the AHB map about every six months. Download a larger version (1,500 by 1,150 pixels, 194 K). Download a 300-dpi high resolution version suitable for printing (2,975 by 2,239 pixels, 520 K). Visit the USDA Afrcianized Honey Bees website.